The Mechanical Circulatory Support Pocket Guide is based on the latest guidelines from the American Heart Association (AHA) and was developed with their collaboration. 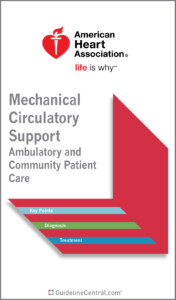 This practical quick-reference tool contains recommendations for ambulatory and community care of patients requiring mechanical circulatory support. Mechanical circulatory support (MCS) offers a surgical option for advanced heart failure when optimal medical therapy is inadequate. MCS therapy improves prognosis, functional status, and quality of life. Ambulatory patients with MCS can span the entire age spectrum from pediatrics to geriatrics. Because patients with MCS are becoming increasingly mobile, basic knowledge of equipment is necessary for personnel in public areas such as schools, public transportation, and airplanes/airports. The primary MCS team should be contacted for any patient-related emergencies. In non–life-threatening situations, care providers inexperienced with the management of MCS should defer device management to patients and their family caregivers until contact can be established with the MCS center or device company technical support. Whenever possible, emergency medical service providers who will be transporting a patients on MCS should also transport the patient’s backup and peripheral equipment. A Doppler probe and a manual cuff can be used to obtain blood pressure in a patient supported by continuous-flow MCS because the automated measurement of heart rate, pulse oximetry, and blood pressure may be unreliable in this setting. Once pump function is established, assessment of the unstable patient on MCS should begin with a general evaluation of the patient for the inciting condition (e.g., arrhythmia, hypovolemic or distributive shock, and acute blood loss). Outpatients who present with MCS device stoppage should not have the device restarted without the guidance of the primary MCS center. Device parameters such as power, speed, flow, and pulsatility should be recorded throughout the patient’s course. If battery power is low, either the batteries should be replaced or the configuration should be changed to wall power. When power source is confirmed but there is a persistent device alarm, the controller should be exchanged for the backup controller. If thrombus is suspected, assessment for hemolysis, including lactate dehydrogenase, is recommended.